Child of the Universe. 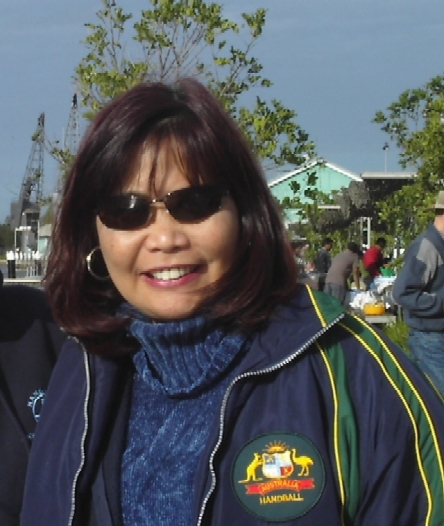 Filipino-Australian Correspondent, based in Sydney. Alumni: University of the East, Manila in the Philippines; University of Techonology Sydney [B. Bus] and Flinders University in Australia. Avid fan of football and handball, her sons' sports. Loves music and good sense of humour. Greatly appreciates everyone and everything that promotes tolerance, social justice, world peace and respect for the environment. The author's mission in 'One Day in May – Bleiburg 1945' is to provide an up-to-date narrative of events known as the 'Bleiburg Tragedy'. Written in the English language, this 314 page book focuses on the negotiations at the Bleiburg castle, includes maps and photographs, and provides answers to important questions using numerous sources, including British, American and Croatian. The author, Jean Lunt Marinovic, is of British background, has published over 100 articles in the Croatian-Australian media and has been active in the Croatian community since the 1980s. The journey of Croatian-American composer/singer and writer Nenad Bach through war and peace, and rock and roll captured in the documentary/feature film ‘Everything is Forever’ won top awards at the 47th Annual Worldfest Houston International Film Festival (April 4-13). The feature film garnered the prestigious Platinum Remi Award for Theatrical Feature Film & Video Award and the Special Jury Remi Award for Music Video Award – Stage Concert/ Performance. Written by Violi Calvert. On the photo Stehanie Silber, Victor Zimet and Nenad. He was twice awarded World Handball Player of the Year, he was elected "Best handball player ever" by the users of the International Handball Federation website - and now Ivano Balic (left) is in the focus of the 2010 IHF World Handball Photo of the Year competition. The Croatian photographer Antonio Bronic found the exact right part of a second to take his picture of Ivano Balic flying through the air and unsuccessfully trying to catch a ball against Alexander Petterson. Travels bring experiences and memories that last a lifetime. They give us the opportunities to visit beautiful and interesting places, and meet amazing people. During a recent holiday my husband and I had included a 10-night Mediterranean cruise. In his welcome address I noted that the Captain is Croatian. Captain Iv Vidos reflected in his talk to passengers his great love for the sea and his mission of ensuring the safety and enjoyment of the holidaymakers as well as the staff of the ship. Aside from sharing valuable information and pointers, his good sense of humour came through his announcements before docking at various ports. Violi Calvert, collaborator of the CROWN from Sydney: Hi, I wish to advise that Nenad will be interviewed by Croatian radio in Beijing, which could be streamed through the website: http://croatian.cri.cn on Monday, 18 October at 4-5pm Beijing time [10-11am Zagreb time; 4-5 am New York time; 7-8pm Sydney time]. After an one-sided final and a rather charming closing ceremony, the III Men's Youth World Championship in Tunisia came to an end on Friday. Croatia now is the 2009 Men's Youth World Champion, after beating Iceland in the final with 40:35. For the fifth time, Ivan Dragicevic (left) came back to Australia in his mission to share the love and messages he has been receiving from Our Lady. The First of his talks in Australia was in Melbourne, Victoria followed by six other places in the states of New South Wales and Queensland. The last of these talks was held on 26 February at The Sacred Heart in Pymble. Violi Calvert (left) reports. Australian Parliament progresses Reconciliation between Australia's Indigenous and non-Indigenous people by tendering a formal apology for the hurt caused by past government policies. Left Australian Prime Minister Kevin Rudd. A historical moment for Australia and the whole world. WE LEARN FROM OTHERS ! Quantum leap in human consciousness.